1. In a small bowl, combine cheese, mayonnaise and mustard. 2. 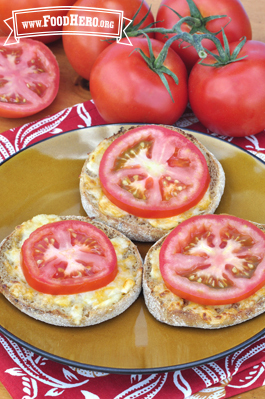 Spread cheese mixture evenly over English muffin halves or bread slices. 3. Broil or toast until cheese melts, 2-3 minutes. 4. Place tomatoes on each sandwich. 5. Serve 'as-is' or broil to heat the tomato, 2-3 minutes. 3. Heat a skillet over medium heat. Add sandwiches bread side down. 4. Cover and heat until cheese melts, 7-8 minutes. 5. Top with tomatoes before or after heating. For extra flavor try fresh avocado or basil leaves under the tomato or add 1/8 teaspoon garlic powder to the cheese mixture.